CaerusPoint specializes in providing career guidance to high school as well as college students. Our career guidance products will help students make informed decisions about their future career. 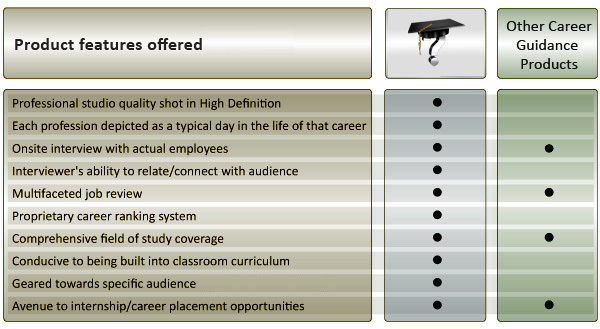 Our unique value proposition provides a best in class experience to the aspiring student. ..... we bring careers to life. The product is in the form of videos, (also available in DVD or streaming), that are shot and produced in HD, and is designed to represent a typical day in the life for each career. We portray a day-in-the-life of a career in an exciting and up-beat way. In order to make the featured careers come to life we interview real people in real jobs at real companies. The show, Major Decision, is conducted by two young hosts of diverse ethnicity to whom our target audience can relate and are edited in such a way that it provides the student with an "as realistic as possible" view of a typical day in the life of that career. Our first series of Major Decision comprises of 20 careers spanning 11 Industries. Each episode covers one career and is depicted as a day in the life of that career. Major Decision is conducive to be used to be used by career guidance counselors and home schooling parents as either prescribed or supplemental material during career education at High schools and Colleges. In addition, we have deliberately created each episode to be 22:30 minutes in length to facilitate TV broadcasting. Accessing our range of products/videos is focused on being user-friendly by streaming the videos via our iPhone / iPad app. Through this app users can scroll through the industries, find a career of choice and either view the video or launch the graphics used in the show such as career hierarchies and the related proprietary career rankings.